Spread Easter cheer with this pop up Easter Basket. 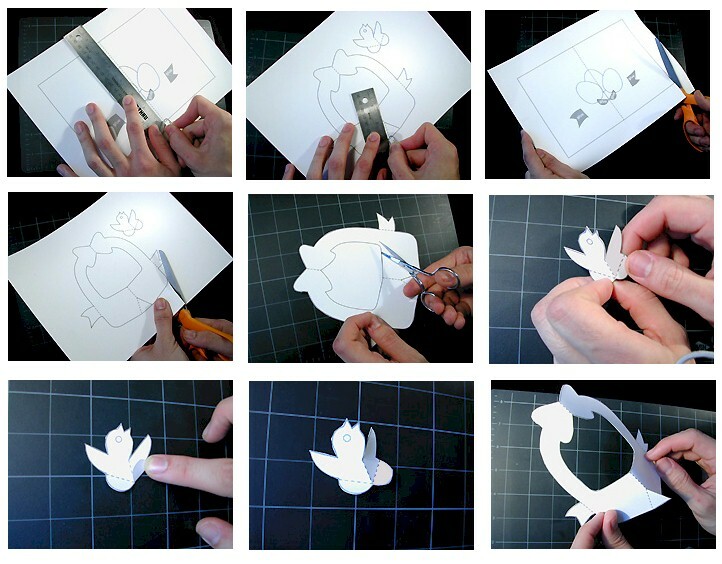 Click on Printables for complete illustrated instructions. 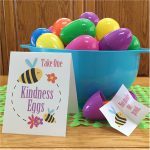 Print out the Easter basket card and pieces on a heavy paper, like construction paper or card stock. Using a ruler as a guide, take the rounded end of a paper clip (or a ballpoint pen that has run out of ink) and press along the dotted line on the center of the card. Go all the way from the top to the bottom of the card! Do the same for pop-up pieces. There are LOTS of dotted lines on this pop-up so take your time and make sure to press along ALL of them! Color in the Easter eggs with crayons, markers or colored pencils, then carefully cut out the card following the solid, black lines. DO NOT cut out any of the lines of the Easter eggs. Color in the basket and chick pieces. 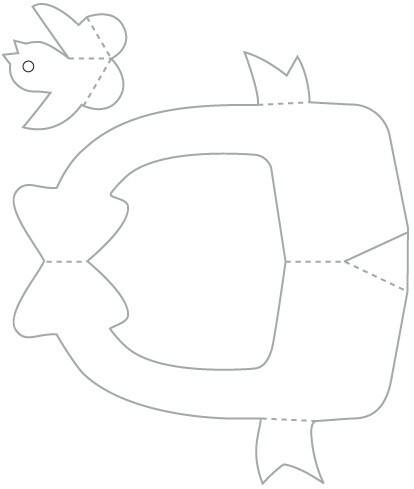 Carefully cut out the basket and chick pieces following the solid, black lines. Using a small pair of pointed scissors (get an adult to help you with this part), poke through and carefully cut out the center of the basket. Take the chick and carefully fold it in half along the center line. Fold the small tabs at the bottom of the chick up and crease well. Fold up both the left and the right tabs and put back down into their original positions. This is how your chick should now look. It is folded in half along the center line and the two tabs are coming forward like little feet. Put the chick aside. Take the basket and fold it in half along the center line. Take hold of the small tab at the bottom of the basket and fold it away from the front and crease. Return the tab to its original position.Apply a small amount of glue to this tab. Pull the tab behind the right side of the basket and match it up to the center line. Hold the tab in place while the glue dries. Be patient! Fold the basket completely in half and lay down on the table. Take the ribbon tab at the side and fold over towards the center of the basket and crease well. Return tab to its original position. Turn the basket over and repeat with the other ribbon tab. Fold the card in half, crease well and open up again. 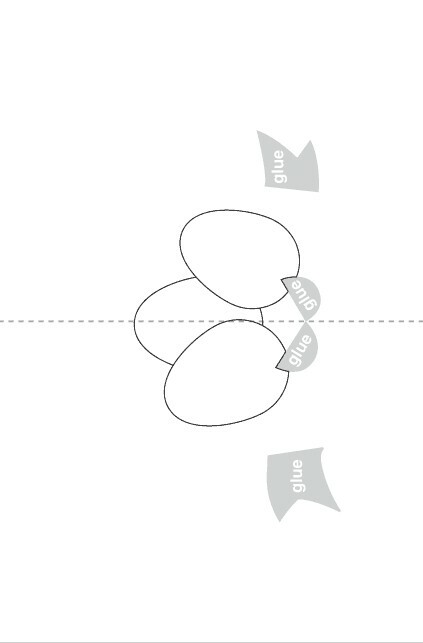 Apply a small amount of glue to the two glue areas near the center fold of the card. Take the chick and match the tabs up EXACTLY with the glue areas on the card. When the chick is in position, it should lay perfectly flat against the card. Wait for the glue to dry! 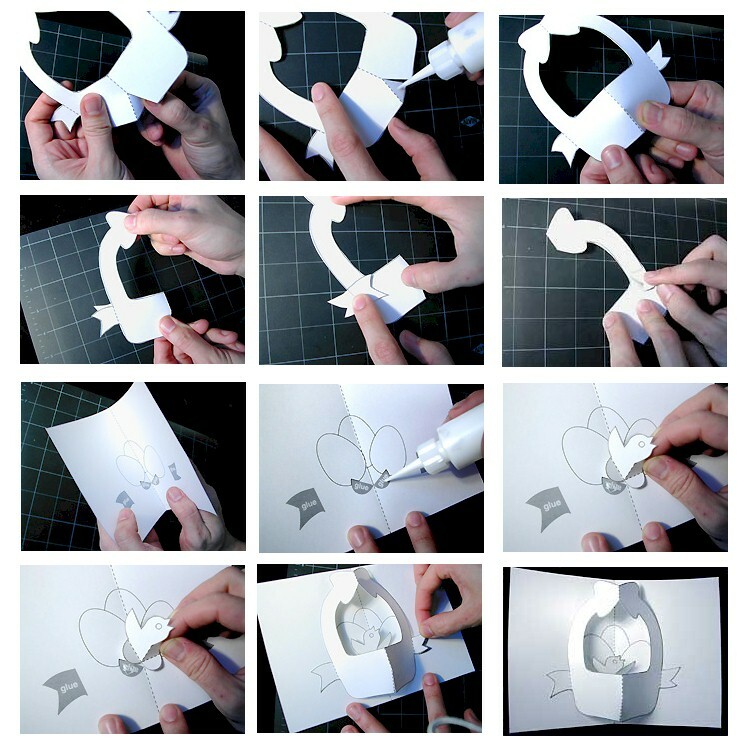 Apply a small amount of glue to each of the glue areas on the outer sides of the card. Take the basket and match the ribbon tabs up EXACTLY with the glue areas on the card. Do one tab at a time and wait for it to dry a little before attaching the second ribbon tab. Wait for the glue to dry! Carefully close and open the card. Your pop-up Easter basket is finished! Happy Easter! This craft reprinted courtesy of Robert Sabuda.